This geeklist is a collection of the games from the 2013 Solitaire Print and Play Contest. The entries this year have been awesome! I hope that you'll enjoy these games! At the time of this writing, the contest is still in the voting phase so head over to the Contest Thread, try some games, and vote for your favorites! In general, the people want to make films of their genre, which produces resources of the same color. However, I think I'll have a rock, paper, scissors thing where the resources can help get new things in other categories or against an AI. For example, Acclaim can get a new producer, or Power can stop a union strike. In "Colony 9" Humanity is exploring space, the final frontier, and establishing colonies in other planets. The player must build different structures to establish a colony before the spaceship with the people (civil, military) that lives there arrives. But beware of aliens and other disasters! Colony ZXC123 is being threatened by the Boss Squad, and it's up to you and your CRMA (Combat-Ready Mechanized Armor) to protect them! Roam the area around the colony, defeating deadly monsters and enemies, escaping deadly encounters, and confronting the deadly members of the Boss Squad in deadly single combat! This is a pretty quick dice game, based on the game Cribbage. I'm calling it Cubbage (cube bage), but might change the spelling a lititle. You need 13 dice (6 of one color, 6 of another, and 1 final die which should be different if possible), and something to keep score. A Cribbage board works best, but pencil and paper can be used too. For those that know Cribbage, there are many similarities, but it isn't the same game. Scores each round seem to be higher, and the player has an advantage over the invisible opponent. You will probably want to track how much you win by, and start you opponent several points ahead. Also note that the numbers are different from Cribbage, and you might catch yourself saying the wrong thing. Its a solitaire dungeon crawler type that plays with a small deck. 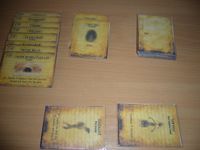 A portion of the cards are dealt face down in a variety of layouts such as "the Pyramid solitaire game" then players will have a hand of 5 cards which will act as their inventory of potions and other items. To explore simply uncover a card that is free if it is a monster you need to fight it by playing a card from your hand adding the bonus to beat at least 2 of its 3 stats. Once a monster beaten it goes to your discard pile which in turn increases your inventory like a deck building game. On the other hand if you miss then you remove cards from the top of your deck. If your deck runs out its game over. The mad sorcerer Grislyk has stolen the Book of Lore from the elves and hidden it in his dungeon lair. As the elven warrior maiden Kora, you must brave three increasingly dangerous levels to recover the Book, destroy Grislyk’s magical Black Crucible, and slay the wizard himself. Magical artifacts will help you evade Grislyk’s traps and slay his army of goblins and skeletons, but you will also need your wits and a bit of luck, for knowing when to search, when to fight, and when to run is the only way to survive the DUNGEON OF DEADLIEST EVIL. The story takes place in Dystopia, a megapolis in a not so distant future, filled with corruption, dangers and crime. You are one of the four agents of Sector 9, a special investigation team, of the Dystopia Police Department (DPD). 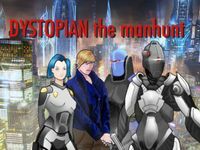 A murder has been committed, and you'll have to investigate the different many locations of Dystopia interrogating the people you encounter and looking for leads and hints on the investigation. You'll also need to analyze the info you gain, which will give you clues that will ultimately unveil who the criminal is. Once you know who the criminal is, you'll need to seize him/her/it. You’re caught in an endless, ever shifting nightmare hunted by The Shadow – an ominous all devouring presence. You try to outrun it and avoid going insane from the horrors of the nightmare, but it’s just a matter of time until you succumb. 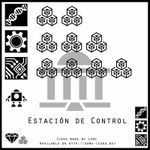 Mechanically the game is a simple push your luck, risk management game consisting of a small rulebook, a one page game board, 10 small markers and a six sided die (markers and die must be supplied by you). The game also has an “Active” version (requiring more components) where you for example have to hold your breath in real life to avoid drowning in the game. Have you ever wanted to see what would happen if Darth Vader and the Terminator had a battle to the death? What about Megaman vs Sonic the Hedgehog? Well, your glory days are finally here! Come and experience the glory days of print and play in a game that would be so expensive to produce that Games Workshop and Fantasy Flight Games would keel over and go bankrupt trying to get this game to make money. 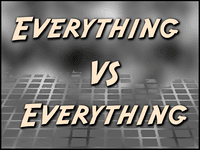 This game stole IP`s from as many sources as possible to bring you THE ultimate grudge match. Hurry up and try it before every lawyer this side of New York City drops a C and D letter so large, it would crush the empire state building. 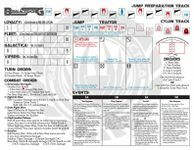 A game set in the Battlestar Galactica universe using a variation of Mads L. Brynnum's "Dice Of Arkham" mechanic, you must safely guide the Human Fleet to Kobol before the Cylon fleet rips you to shreds! More than a simple re-skinning, mechanics have been changed or modified to create a unique playing experience! You are Captain Sama Kollin, commander of the U.N.S. Herald, the first human spaceship capable of trans-light-speed travel. Your mission is to guide your ship in its voyage of exploration, accomplish results that repay humankind of the tremendous efforts that made the voyage possible, and come back to Earth to ignite enthusiasm for the New Frontier and silence the Isolationists. Irish Freedom covers the Irish war of independence, and then the Irish civil war. The player controls the Irish forces fighting the British, then, after the treaty with Britain, plays the role of Michael Collins' Free State forces against the anti-treaty Republicans. this game loosely follows the story of Heracles rescuing Alcestis from Thanatos in the Underworld. in the game he'll battle various dead warriors and mythical monsters while visiting some of Hades' scenic places. all of these location and encounter cards will be shuffled together. so you'll know things are coming but not in what order. 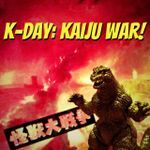 K-Day: Kaiju War! is an action point-based solo dice game in which you play Zillasaur, and have 14 days to destroy cities to score victory points. You mission is not as simple as it sounds, as Guardian kaijus emerge to roam and protect the land. So wreck the cities! Destroy their armies! Battle kaijus! This is K-Day: Kaiju War! The setting of the game is a small town in rural France in the middle of the Vichy government/Nazi occupation era. The player takes the role of a small band of resistance members, trying to complete tasks to annoy, delay and/or overthrow the occupiers and the dirty collaborators in the Milice before the townsfolk lose hope completely. A card & dice driven solitaire game that takes place in Chicago during prohibition. Each turn consists of four phases: Upkeep, Assignment, Actions & Events. You assign dice (the number of which is based on your reputation in the game) to actions each turn. The game lasts 22 turns which is dictated by the Event Deck so no having to keep track of what turn you are on. A unique play through each time! 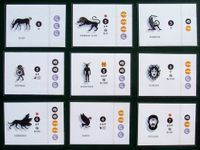 A Night in Deepwail Manor is a short and simple push-your-luck game for 1 or 2 players playable in 5-10 minutes that uses only a small deck of around 30 custom cards. The player (or players) will control two children who explore the creepy Deepwail Manor on a dare and face eerie locations and dangerous encounters as they venture deeper into the mansion. The game is, in essence, a horror survival game: ammunition for your firearms is limited and your character is relatively squishy and your best bet tends to be to run. Each character presents their own challenges and advantages, having different equipment initially available but essentially the same goals. All the while, a spooky narrative table adds to the ambiance and horror. Tombs is a quick and easy game of tombraiding in both colour and (printer kind)lineart versions. The tombs board is a brickwork grid of tiles the player must navigate to reach thier goal. 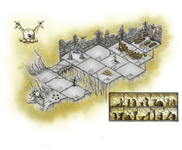 However the Tomb is always geared against the player who must keep thier valiant band of explorers alive by managing equipment to argument the trials of the Tomb and steal the treasures. Zombie Solitaire is like regular Klondike solitaire with one big difference: you get to destroy Zombies!! !